This week, the high school students had an essay in our writing class. The assignment was about procedural language, and the students were supposed to write a procedure for lacing up their shoes. HOWEVER, they weren't supposed to do it in the way they usually do. They were supposed to find a NEW way to lace their shoes. Some of the students did diagrams, which was all right, but I would have preferred them to use language and give instructions. A couple students gave instructions for how they USUALLY lace their shoes. However, this was a learning experience. Their next assignment is to find an appliance in their home that takes at least five steps to operate and write a procedure for operation. One of the things I explained to the students is that in almost every job I've ever had, I've written a procedure manual on how to work the equipment (often because I was the only one at the time who actually knew HOW to operate the equipment, being the company guinea pig and all). So, I showed them the "Operations Manual" I made for Seishin, with instructions on everything from putting grades into the computer, to using the copy machine, to filling out necessary forms. Being able to write a procedure is a very useful skill. Saves a lot of time in explaining things to people. Just hand them the book and tell them to follow the steps! Yesterday, two of my high school first graders went to speech contests. 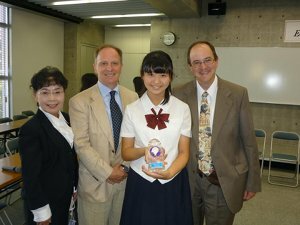 Brian went with one of my high schoolers to the 5th All Japan High School English Speech Contest preliminary at Kurashiki Minami High school, where she won 2nd Prize! She'll go on to the next round! I went with the other student to the Notre Dame Trophy English Speech Contest at Notre Dame Seishin University, where she shared the Excellent Prize (like 2nd place) with another student whose speech was also really great. I was SO impressed by all the students. It was a VERY high level contest. Here's a picture taken by my student's mother. Last Sunday was the Seishin Culture Festival. Here are some pictures. Here are the first graders in writing class. Here the second graders are having a discussion. Here are the third graders in a discussion. This week, the junior high school students were working on debates. The first grade topic was "Should junior high school students get discounts on buses and trains?" The second grade topic was "Should students be allowed to choose their teachers?" The third grade topic is "Should we repeal the Japanese government law that levies penalties against companies that hire overweight workers?" The third grade debate will be next week. Today, I talked to the high school first graders about their first reports. I could have done a better job. Luckily I have some good ideas for next time. Next week, the junior high school NELP students will begin their first reading of second term. The first graders will be reading a poem called "An Easy Decision" by Kenneth Patchen. It's about a man's unusual encounter during an evening walk. The second graders will be reading a poem called "Class Pest" by Kathy Kenny-Marshall. It's about an annoying boy! The third graders will be reading a poem called "Chelsea Had Some Chocolate Milk" by Ken Nesbitt. It's an unusual little poem about a rather messy class. I hope the kids will enjoy the readings.